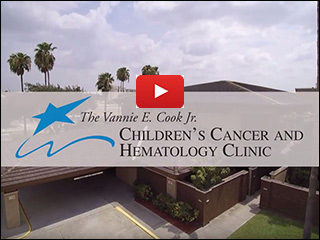 Over 300 miles away from Texas Children’s Hospital is the Vannie Cook Children’s Clinic. Located in McAllen, Texas, the facility is an extension of Texas Children’s Cancer and Hematology Centers, dedicated solely to pediatric cancer and blood disorders in the Rio Grande Valley. The clinic opened in 2001, as a joint venture between a local foundation, the Vannie E. Cook Jr. Cancer Foundation, Baylor College of Medicine and Texas Children’s Hospital. Since then, more than 9,500 families have found the care they need right where they need it most – in their own backyard. During the first year of operation, clinic staff expected to see about 100 patients. Instead, they saw more than 400. “It was obvious how critical our presence was, but the community thankfully trusted and bolstered our ability to serve them,” said Bernini. Texas Children’s/Baylor College of Medicine physicians staff the clinic in the only comprehensive pediatric cancer and hematology center in South Texas. The outpatient clinic is comprised of over 10,000 square feet of space with two waiting rooms, seven exam rooms, two procedure rooms, two phlebotomy stations, two laboratories and a large infusion suite divided into areas for toddlers, young children and adolescents, respectively. In addition to offering diagnostic and cancer treatment services, the clinic offers a long term survivor program which follows childhood cancer survivors through adulthood, and a research program that offers participation in epidemiology studies and clinical trials. As a member of the Children’s Oncology Group (COG), we are able to provide local children with critical access to clinical trials. This is particularly important since a large portion of the population that we treat is Hispanic, a population that is generally under-represented in clinical trials. Leaders with the Vannie Cook Children’s Clinic and its partners are always evaluating the services provided at the clinic and are constantly striving to deliver the best care possible to the children served in the Rio Grande Valley. Dr. David Poplack, associate director of the Cancer and Hematology Centers and director of Global HOPE, helped pave the way for the partnership between Texas Children’s and the Vannie Cook Foundation. He has always said that supporting the clinic was and continues to be the right thing to do.